Using beautiful lattice flowers, you can create a lovely card using the Lovely Lattice stamp set. This stamp set if offered for free during Sale-a-Bration with a $50 purchase. Sale-a-Bration runs through March 31st but is already exceeding expectations. So make sure to get to the goal you want to be at and earn all the products you want. To show you a little of what this stamp set can do, I have the video below from Stampin’ Up! If you have not received one, you can check out the Sale-a-Bration catalog here and see the variety of products you are able to earn for free. The Occasions Catalog is also available now and has a variety of products that coordinate with our Sale-a-Bration products. The beautiful lattice flowers will be a great prorduct for you to experiment with this Spring. Shop all products in my online store here. I’m happy to help answer any questions about SAB or the Occasions Catalog. Besides a FREE Sale-A-Bration Item, when you place a $50 order, you’ll also receive a PDF with 9+ Card Tutorials featuring the Needlepoint Nook Suite. But, wait… there is more! 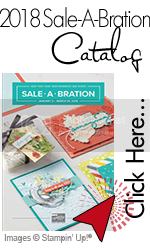 With a $75 or larger order, you’ll also receive 14 Paper Crafting PDF Tutorials featuring Sale-A-Bration products created by the Stampin’ Glam Squad.